Diagram 11 shows the coordination of arms and legs during the attack step. 11a is the starting posture, 11b shows the Shinai thrusting forward as the right foot begins to rise. 11c shows the Shinai lifting and still thrusting forward, whilst the right knee begins to punch upwards. 11d shows the highest point of the stroke, with the arms stretching upwards. 11e shows the mid point of stroke the whole body is in the air and the blade is in roughly the Jodan (high posture) position. 11f shows the moment of impact as the Shinai is thrown forward. The action of taking off on the first Tsuzukete (follow-through) step will be approximately that of 11c. Note that the blade thrusts forward before it lifts and that the head line is virtually level throughout. The cut is coordinated with the stamp of the right foot and the left is drawn up almost simultaneously. Numbers 2a and 2e comprise the development of the stroke and from this point the left hand having thrust forward and upwards then pulls downward and throws forward, much as if throwing a knife. The right hand does almost nothing only guiding direction and aiding in the control on impact. The arms and hands should be supple and relaxed until about two or three inches above the target, there is then an instant of tension in the Shibori (wringing) and Ki-ken-tai-ichi as the action is concentrated. There is then another moment of relaxation in taking off and a slight tension in controlling the following-through blade. 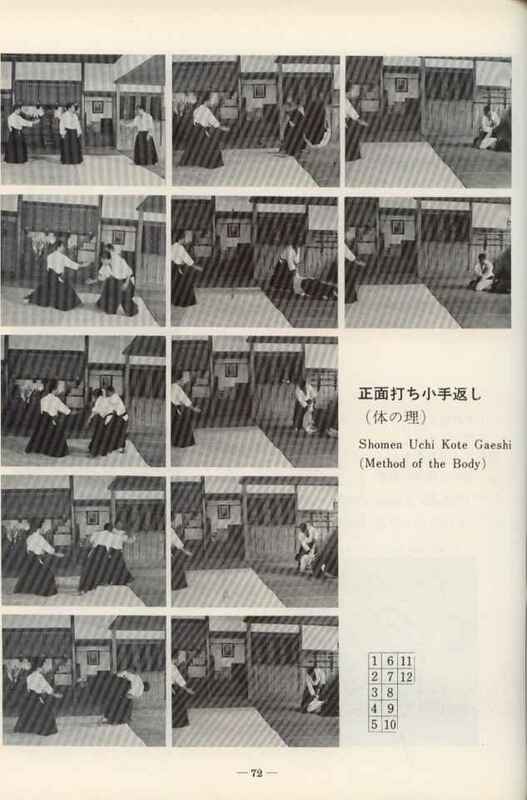 Most movements of the Shinai, including the attack stroke will be found to consist of interplay between centrifugal and centripetal force and also of relaxation and tension. If great strength is applied the result will be rigidity and the accumulation of force described in principle two cannot flow freely into the blade. If the tension is timed too early the blow will be dead for the same reason and the same will apply if it is too late. A nice technique results in perfect coordination of all factors.